Location: Omni Hotel South, Austin, Tx. This is a local pageant open to young ladies in Brazoria County. The pageant is held the Thursday before Thanksgiving at the Lake Jackson Civic Center Ballroom in Lake Jackson, Texas. Teen contestants age 15 - 18 years old. Queen contestants age 19 - 26 years old. Location: Radisson Hill Country resort in San Antonio, Texas. This IS a STATE preliminary. Winners advance on to the Nationals in Houston in March, 2003 & will represent their TEXAS titles for the Miss Latin & Miss Teen Latin Image. The Petite Pageants are only for Petite women 5'6" tall and under, Ms. Contestants are age 19-29 and Teen Contestants are age 13-18. This is the only Petite Pageant throughout the US and Internationally. No experience is necessary and there is no talent competition. Teens have a Sportswear competition instead of a swimsuit like the Ms. The 2003 Pageant is scheduled for February 14-16, in Houston, Texas. Delegates must be at least 13 and not over the age of 19, as of July 15, 2001. THERE IS NO SWIMSUIT OR TALENT COMPETITION. This program seeks young women who are involved in school or community activities, and are goal oriented. Over $15,000 in college scholarships and prizes will be awarded at the state finals. The 2003 Pageant will be held June 4-8, 2002, in San Antonio at the University of the Incarnate World and the host hotel will be the Sheraton Four Points on the Riverwalk. Teen contestants age 15 - 19 years old. Miss contestants age 18- 28 years old. You can compete as a contestant at large if there isn't a preliminary available in your area. 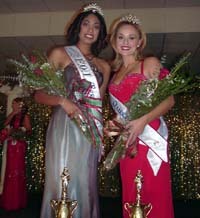 The 2003 pageant will be held January 25 in Austin at the Holiday Inn Arboretum. Teen contestants age 13 - 19 years old. Miss contestants age 20 - 28 years old. Meet and talk to the reigning Miss Dallas United States Teen, Lyndi Clark. Ladies between the ages of 13-25 within a 150-mile radius of Dallas are eligible to compete. The 2003 pageant will be held February 3, at the Renaissance Houston Hotel. Contestants must be ages 15-18. No experience is necessary and there is no talent competition (as there is in the America system). The 2003 Pageant was held in Lubbock, Texas July 13-15 2001, with the event televised live on CBS Monday July 30! The Miss Texas USA Pageant is for single ladies between the ages of 18-26. No experience is necessary and there is no talent competition (as there is in the America system). Official preliminary for the Miss USA and Miss Universe pageant systems. The pageant accepts checks, Visa, MasterCard and American Express for contestant fees, advertising fees, sponsor fees and tickets. Contact the Director: Betty Warner for application and meeting locations! 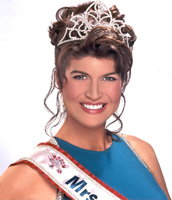 Pageant Trivia: The former Miss Austin USA 2000, Kandace Krueger was Miss USA 2001! The 2001 Pageant was held March 24th & 25th 2001, at the NASA Bay Hilton. Contact the Director: Sharlet Hairr for applications and information. 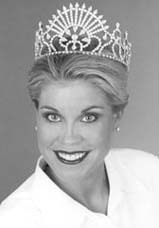 Pageant Trivia: Miss Bay Area USA 2002, Nicole O'Brien is the reigning Miss Texas USA 2002! Orientation will be held Sunday, Dec. 8, 2002. Contact the Directors: Missy Demeris or Patty Lanning for applications and information. The 2001 Pageant was held March 16-17 2001. Free Information Meeting: October 20 at 2:30pm. Holiday Inn Select, located at 77 NE Loop 410. For more info click here. The 2003 Miss Pageant will be held July 2003 in Fort Worth, Texas. The Teen Pageant is held Monday and Tuesday during Miss Texas Pageant week in Burleson. Miss Contestants must be 17 and at least a senior in high school at the time of the local preliminary and no older than 24. Teen Contestants must be between the ages of 13-18. 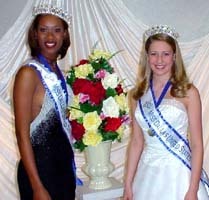 The 2003 Pageant will be held January 2003 in Marshall, Texas. Contestants must live in one of the following counties: Bowie, Camp, Cass, Cherokee, Franklin, Gregg, Harrison, Hopkins, Marion, Morris, Nacogdoches, Panola, Rains, Rusk, Shelby, Smith, Titus, Upshur, Van Zandt, Wood. Contestants will compete in Interview, Talent, Swimsuit and Evening Wear. Miss: There is NO Entry Fee and among other prizes the winner will receive a $250 Educational Scholarship and will compete for a chance at the title of Miss Texas in Ft. Worth, July of 2003. Teen: Entry Fee is $100 and winner will receive many prizes and a scholarship as well as the opportunity to compete for the chance at the title of Miss Teen Texas in July, 2003. *This pageant is NOT connected with Any other pageant system for married ladies and we will NOT advance on to another level - this will be a STATE only pageant! Telephone: (585) 388 - 2857. There will be a Mrs. Texas United Nation pageant for the first time this year! The winner will go on to compete this summer at the Mrs. United Nation US 2001 pageant in California. 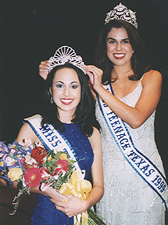 The pageant was May 4-5, 2001 on the campus of Texas A&M University in College Station, Texas. Activities included a family night for the delegates and their families. Both contestants and volunteers are being sought. 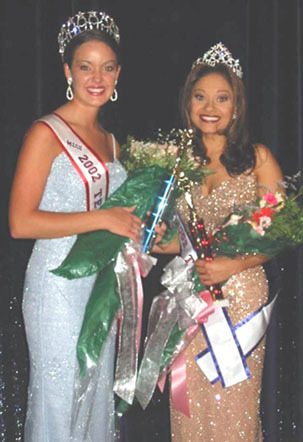 The 2001 Pageant was held on Friday, March 2 in Gary, Indiana. The winner goes on to represent the United States at the Miss Universe pageant! The USA Pageant system is for single ladies between the ages of 18-26. No experience is necessary and there is no talent competition (as there is in the America system). Here you can find links to your state pageant, check out the delegates from all the other states and find out what the new Miss USA is up to! The 2001 Pageant is scheduled for July 24-29, 2001, in Houston, Texas. The pageant will be hosted by Dallas, Texas in early June. Contestants must be at least 25% Hispanic heritage and are not required to speak Spanish. The Miss Latina World pageant is only open to Miss age contestatns. Miss contestants are age 18-26, Teen are age 13-17, and Ms./Mrs. must be at least 18. The 2001 Pageant will be held July 2-5, 2001 in San Antonio, Texas. The winner of the Miss Latina Pageant goes on to represent the United States at the Miss Latina World Pageant!! The winners go on to nationals! Call 903-891-9761 for more information on entering a preliminary pageant or go to the Official Web Site: www.misslatina.com. It's best to email or call the national office and they will forward it to the appropriate director. The Miss Latina Connecticut 2001 Pageant will be held March 1, 2001. The Miss Latina Illinois 2001 Pageant will be held March 16, 2001. The Miss Latina Massachusetts 2001 Pageant will be held March 16, 2001. The Miss Latina Nevada 2001 Pageant will be held April 1 , 2001. 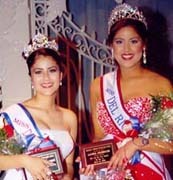 The Miss Latina North Florida 2001 Pageant will be held April 1, 2001. The Miss Latina North Texas 2001 Pageant will be held March 24, 2001. Cindy Vela will be in attendance. The Miss Latina Rhode Island 2001 Pageant will be held March 16, 2001. The Miss Latina Southeast Texas 2001 Pageant will be held March 30, 2001. The Miss Latina Southwest Texas 2001 Pageant will be held March 14, 2001. The Miss Latina Wisconsin 2001 Pageant will be held March 24, 2001. 2002 Pageant was broadcast live on the CBS from South Padre Island, Texas in August 2002. Contestants must be ages 15-18. No experience is necessary and there is no talent competition (as there is in the America system). The 2002 national event was be held July 29- August 5, 2001 at SeaWorld's Anheuser-Busch Theater in Orlando, FL. The Miss North America Teen competition is a program for young women between the ages of 13 and 19 years of age. Interview (50%) Judges will evaluate a candidate's inner beauty and character. The judges will also consider the candidate's scholastic and community involvement. ntelligence, poise and the ability to express ideas will be assessed as well. Fitness (25%) Candidates will be judged in a two-piece swimsuit. Judges will evaluate the overall appearance, tone and carriage in swimwear. Evening Wear (25%) Candidates will be judged in a long gown of their own choice. Candidates will be evaluated on personal appearance, poise and personal style. The gown itself is not judged. Celebrity hosts will be Julianne Morris "Greta" on NBC's Days of our Lives and James Hyde "Sam" on NBC's Passions. Among the prizes Miss North America Teen 2002 will receive are $10,000 cash or scholarship, Hollywood, CA Casting Excursion, Modeling/Acting Photo Shoot, Appearance Wardrobe, Designer Swimwear, and a Spokesmodel Contract. The Mrs International 2001 competition will be held August 13-18th at the Louise Mandrell Theatre in Pigeon Forge, TN. Scoring: Interview is 50%, Evening Gown is 25% and Aerobic Wear is 25%. Each contestant is given the opportunity to select a platform of her choice that she spends the year promoting. Husbands are a part of the show escorting their wives in Evening Gown competition, and the husband crowns his wife titleholder. The 2002 pageant was held in California this July. Entrants must be at least 23 years old and married a minimum of one year. You must be a legal resident of the United States or the country you represent. International contestants may be United States citizens residing in, or with a connection to, the country they represent. There is no swimsuit competition. The 2002 Pageant was August 1st 2002, in Las Vegas.